This cake has been a lifesaver over the last few months. Every time I’m heading to university I try and have a couple of slices in my bag because I never know how hungry I might get, and this is the perfect snack. Especially compared to what the vending machines have on offer (ew). Taking your own snacks somewhere is always a good idea if you’re trying to live a healthy lifestyle. You know exactly what you’re putting into you’re body, as you’ve made it yourself. And this nutty cake is full of all things good so you’ll feel fabulous eating it. Plus, it travels amazingly unlike many other soft cakes or muffins that always seen to get squished under everything else in your handbag! 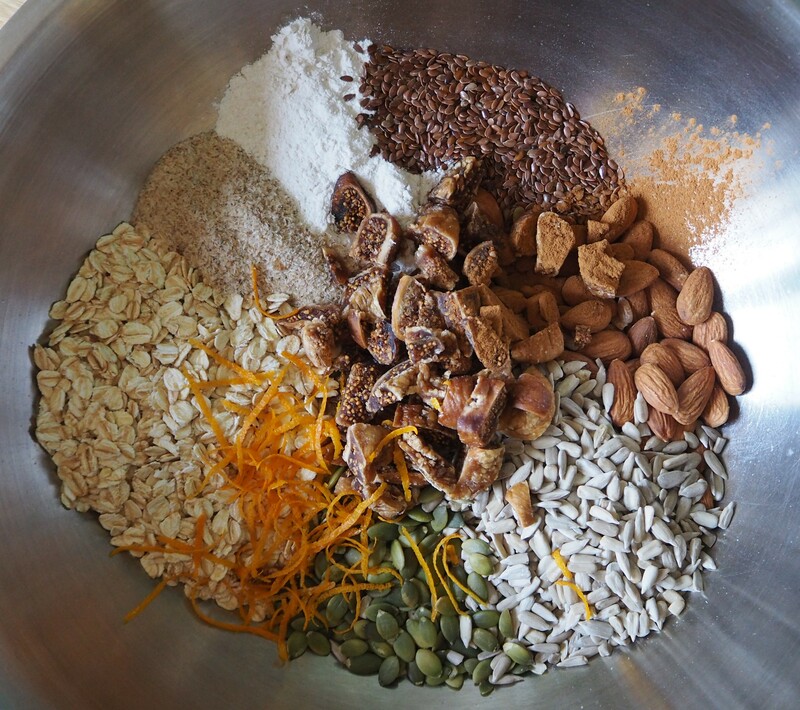 This recipe was inspired by My New Roots life changing loaf of bread. 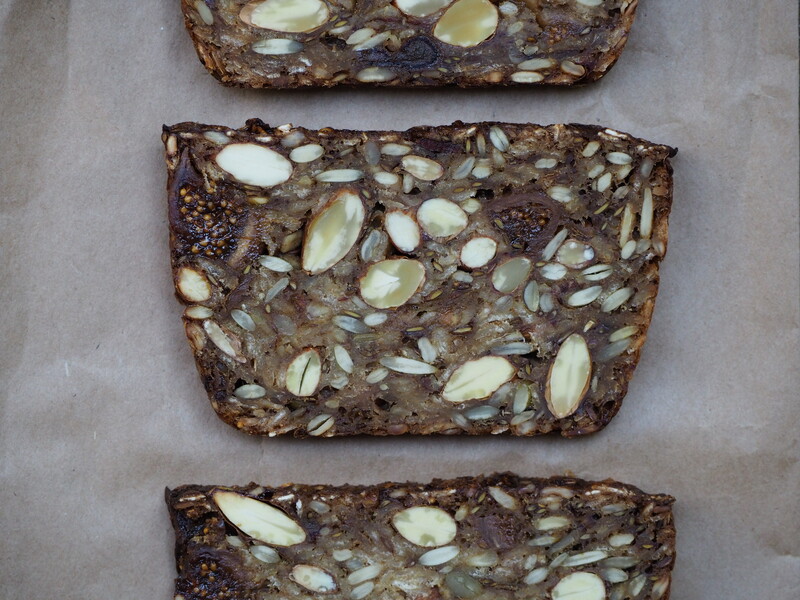 Sarah’s recipe for the beautiful nut and seed loaf can be found here. 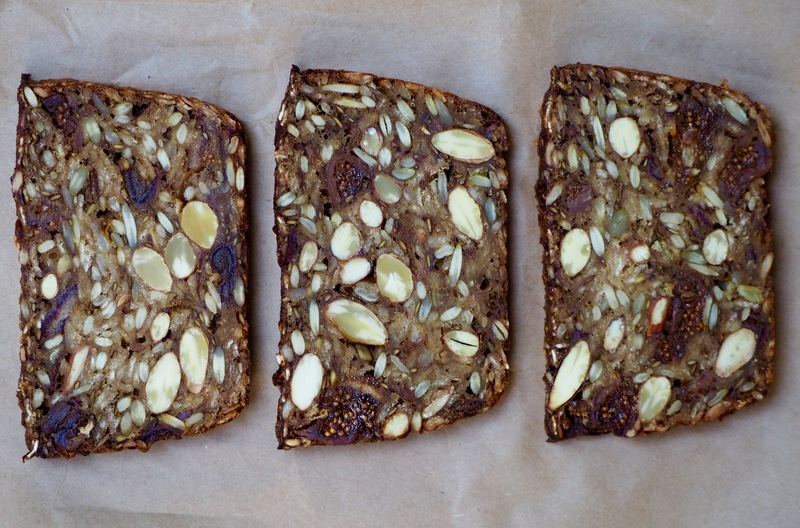 I have simply turned the loaf into a bit more of a cake, with lots of fibre rich dried fruit to make it a sweeter treat. My recipe is completely oil free and has remained vegan, held together only by psyllium seed husk, which is almost like magic fairy dust. It just binds ingredients together so easily so you can have beautiful egg free cakes and bread. Pre heat the oven to 180 degrees celsius. Line a loaf tine with baking paper. Weigh and measure out all the dry ingredients, except the dates, into a large bowl. Add the orange zest and combine well. Place the dates and the water into a small saucepan. Gentle bring to a simmer and cook for 5 minutes, until the dates and soft. Mash the mixture together with a fork and mix into the dry ingredients. Add in the orange juice and up to 1/2 a cup of water. The mixture should be really thick. Scoop the mixture into the prepared tin and flatten the top. Place into the preheated oven for 45 minutes. Remove from the oven and carefully take the loaf out of the tin and place on a wire rack. Brush the maple syrup over the top before placing it back in the oven to cook uncovered for another 20 – 30 minutes, or until golden brown all over. Remove and cool completely before slicing with a sharp knife. Keeps in an airtight container in the fridge for 1 week. Also perfect frozen in slices and lightly toasted before serving. Thank you, it’s so delicious! This really looks good! Always looking for gf, vegan recipes. These cakes are a family favorite! This looks fab, thanks for sharing.